Milbank residential meter sockets can be installed on homes with light load current requirements of 100 amps, up to the demanding requirements of the largest homes requiring single 320 amp meter sockets or multiple meter sockets feeding multiple service panels. Standard meter sockets are manufactured from 16 gauge AISI G90 galvanized steel with a baked gray powder polyester paint finish to improve corrosion resistance. Many standard designs are available in all aluminum enclosures finished with bare metal or baked gray powder polyester paint finish. Standard designs include 4, 5 and 7 terminal meter sockets. 100, 125, 150, 200 and 320 amp (single & three phase) sockets are available for plug-in self-contained meters. 480 amp (single & three phase) sockets are available for bolt-on, self-contained meters. Single meter sockets without breakers are rated at 600 VAC. Meter/breaker combination units are rated at 120/240 VAC. Typically, multiple socket assemblies are rated at 300 VAC. Tamper resistant meter sockets are produced in both ringless and ring type designs to meet the installing utility requirements. The need for uninterrupted electric service can be accomplished by using optional horn bypass, link bypass or lever bypass depending on the socket chosen. 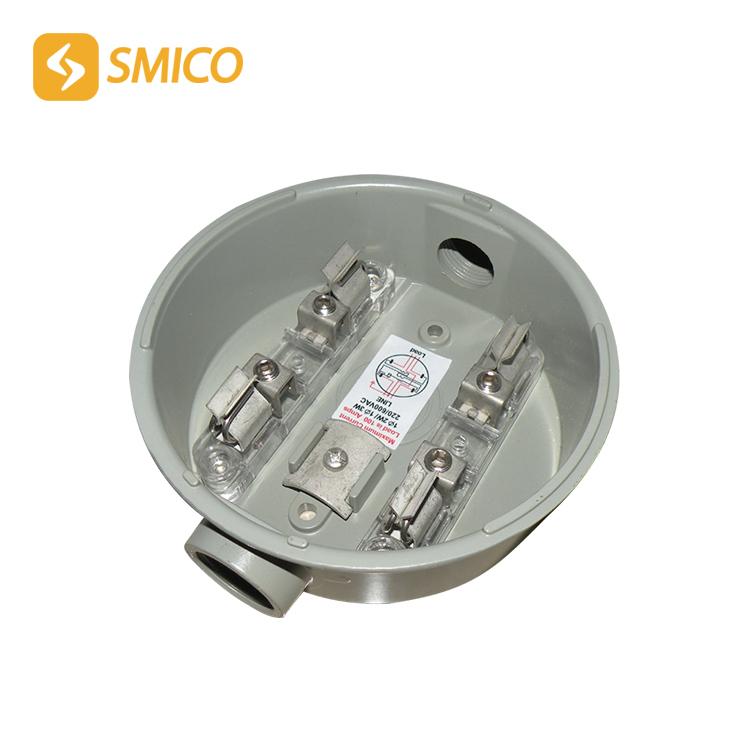 Individual socket designs are available for overhead service, underground service, or combination units can be used for either overhead or underground applications. Increased wiring room can be obtained by choosing a side wireway design in 200 or 320 amp style sockets. Lever type sockets are available in bypass only, bypass/jaw-clamping, or jaw-clamping only. Most sockets are designed to accept conduit hubs from 1" to 2-1/2" size. Many are available for the larger 3" to 4" conduit hubs, and they can utilize optional adapters to reduce from large hub openings to small hub openings. Mounting embosses on backs are standard to allow air flow around socket mounted to structure, which reduces trapped moisture that can cause corrosion.